I’ve already fresh produce items I think will continue to rise in popularity in 2019. You can read them in Part 1: The Low-Hanging…Fruit. Here are a few more I think are a little off the beaten path. I’m not just talking about kale here. I think consumers are over kale in a hipster kind of way. Kale just isn’t…cool…anymore, but healthy food absolutely is. And, greens go along with one of the flavor inspirations I’m seeing in a lot of predictions: African spices. Have you ever heard of Ye’abesha Gomen? Ok, I know most of you haven’t, but they’re Ethiopian braised collard greens and kale, and are out-of-this-world delicious. Recipe and menu trendsetters are always looking for extraordinary flavors, and I’m happy to see African fare is getting its turn in the spotlight. Stay with me here. Do you know how often I hear people talking about ways to cook cabbage? Especially on my favorite Facebook Group to hate: Frugal Family Food. With the economy on the roller coaster it is, I have a feeling people will be turning to more frugal dishes over the coming months, and it doesn’t get much more frugal than cabbage. But, cabbage is delicious, too. Cabbage rolls, sautéed cabbage and roasted cabbage – all of those are great, but I also have numbers to back me up. Did you know the top related queries to “cabbage” on Google Trends also revolve around the trendiest diets kitchen gadgets? All of these are up more than 1000% in popularity over the past five years. Cabbage also is a key ingredient in kimchi: Korean fermented cabbage. 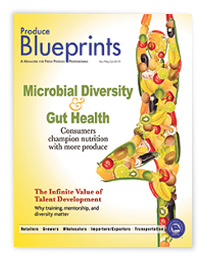 Fermented foods and gut-healthy items are trendy right now, and it all comes full circle. Try teaching consumers how to make their own kimchi or sauerkraut. Did you know sauerkraut is literally just salt and cabbage. Speaking of weird diet fads, I suspect there will be a lot of interest in things like celery juice and okra, as those are making the rounds as health-conscious and “cleanse” recipes rear their heads every season. Organic lemons, too, make a comeback every time people think about cleansing because they’re the original “Master Cleanse” ingredient, along with cayenne pepper and maple syrup. I even saw this book merchandised in the produce department at a Whole Foods in Austin once. Ginger, too, is booming as a drink and cleanse additive. Turmeric, from what I’ve seen, isn’t as popular as it was two years go. 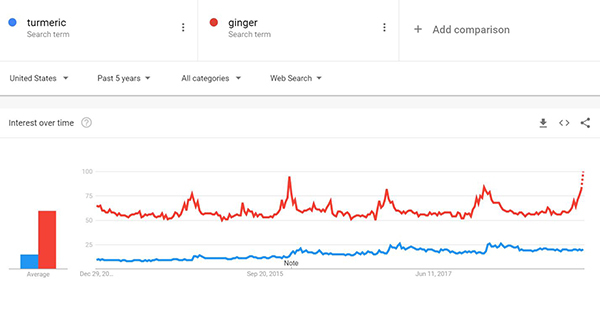 Google Trends popularity of ginger vs. turmeric shows ginger on the way up and interest in turmeric starting to flatten out. I’ve had several people ask me for advice about things like kabocha lately, including someone from a seed company who’s seen a rapid increase in orders for seed for this Japanese winter squash. But even after that, I’m seeing people asking how to cook ornamental pumpkins (which Heather and I covered here), and info cards at stores like H-E-B on how to make pumpkin empanadas from green strip cushaw squash. Using the word “bespoke” with pains me. But, the end result?